As the sun set, my son appeared to be spending the night at school along with his best friend, who's mother was stranded downtown. I decided to brave the roads skating rinks despite my husband's warnings (he was on another continent during all of this, btw). But I knew my son was hungry, and I felt so badly for relying on the bus to bring him home (after all, they were stuck in gridlock too). I finally arrived at school to learn that their bus had just left! I was three cars behind the bus on an icy hill, where a good samaritan was pushing each and every car over the hump, when the bus slipped off the road and got stuck. Thank goodness I was there! Mr. Bus Driver was relieved to say the least, and said, "Ma'am, just take 'em all!" They piled in, one on top of the other, and after Mr. Good Samaritan pushed us back up the hill, away we went. The kids were delivered to their families safe and sound, thankful to have a story to tell. The boys spent the better part of the night sledding to their heart's content. But in all of that action, I forgot to ask the bus driver, if HE needed help. Our educators, administrators, bus drivers were handed a huge load of responsibility and frustration taking care of our children that day. Keeping them safe, making sure they went home with the right parents, keeping them calm and entertained... meanwhile, many of them were not able to connect with their OWN children. Thank you to all of you, for your loving dedication and care. If you are reading my blog, chances are you love antiquing as much as I do. 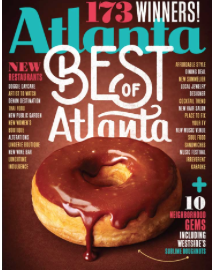 Atlanta Magazine has just published a list of the best spots for treasure hunting. Join my friend, Sherry Hart, as she shares some of her favorite spots (and mine, too) in our city. We are so thrilled to have made the list! A big thank you goes to Lisa Mowry for the mention. Stay warm, and once the snow melts, don't forget to go antiquing! Congrats on the mention … and here's to a warming trend!